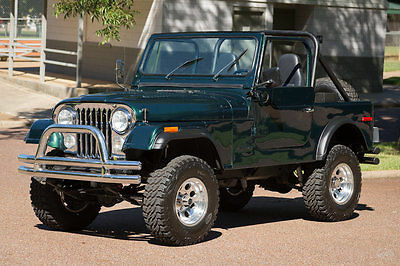 This Clean, Mean 1979 Jeep CJ7 will Make 'em Green with Envy! Evergreen: A word for trees that don't change with the seasons, as well as for ideas that endure the passage of time. It's fitting then, that this 1979 Jeep CJ7 is just that color. These classic 4x4's have earned a well-deserved reputation over the years for good looks, off-road capability, and a driving experience that's just plain fun. This Jeep has benefited from a frame-off restoration. More than $30,000 was invested to bring this Jeep into such great condition. You'll feel like you're famous driving this Jeep, earning compliments, waves, and smiles-even having your picture taken. Would it be okay if it was just the Jeep that was drawing all the attention and goodwill? If you're ready to make an impression, this is the Jeep for you. Call Art & Speed at (901) 850-0507 to make this classic CJ7 your own. Financing available. Art & Speed offers fine collectible automobiles, from original survivor to quality driver, show, and investment cars. We specialize in muscle cars, 50s and 60s classics, as well as modern performance, luxury and exotic cars. Through our network of resources and professional restoration services, Art & Speed can also help you locate that special car you have been searching for. Or let us build the car of your dreams. Art & Speed not only buys quality collector cars, but we also offer a consignment program for our clients who want to sell one car or a complete collection. Employing technology, we market your car to the broadest international audience possible. Art & Speed can also assist you in changing the composition of your current collection. We offer both buyer and seller agent services and can take your car to major auction events for maximum exposure. This vehicle is being sold as-is, where-is with no warranty expressed, written or implied. Although we make every effort to describe each vehicle as accurately as possible, any descriptions or representations are for identification purposes only and are not to be construed as a warranty of any type. The seller shall not be responsible for the correct description, authenticity, genuineness, or defects. It is the responsibility of the buyer to have thoroughly inspected the vehicle, and to have satisfied himself or herself as to the condition and value and to bid based upon that judgement solely. The seller shall and will make every reasonable effort to disclose any known defects associated with this vehicle at the buyer's request prior to the close of sale. Seller assumes no responsibility for any repairs regardless of any oral statements about the vehicle. We reserve the right to end this auction/listing at any time as the vehicle is available for sale in our showroom as well as other internet venues. Deposit of $500 required within 24 hours of auction close. Deposits are not refunded unless the vehicle does not match our description. All vehicles must be paid in full within 5 business days via certified bank funds or wire transfer. Shipping is not included in price. However we will assist the buyer with arranging shipping. Buyer is responsible for all shipping costs.